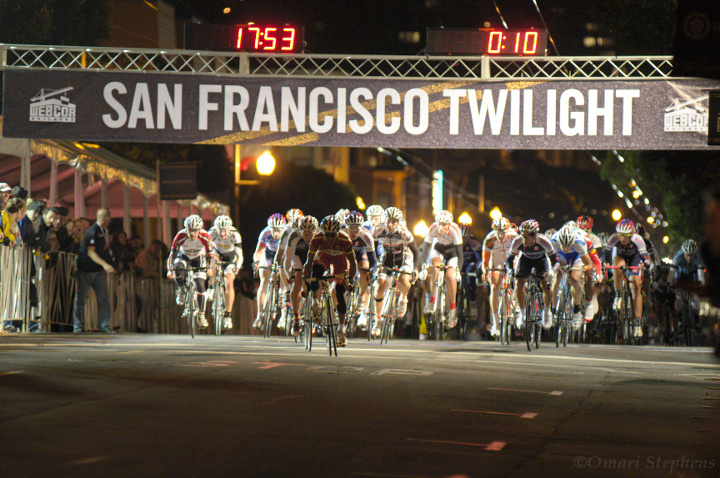 Unlike the Giro di S.F., I was hanging out with some other folks during the Twilight Criterium. This meant that I had to shuffle priorities, but I think I still came away with some solid photos. I pushed myself on some of the photos, trying to master what were, in all honesty, abysmal conditions for flash-less sports photography. That extra effort really shines through in a few of the photos, though, so I'll call it a good day with many lessons learned. First thing: It was dark. The 4-corner racecourse had two level straights, a descent after the first corner, and a hill before the final corner. There were gangs of large floodlights set up at each corner, with an additional pair illuminating the start/finish. The bright, directional lights meant that the lit areas had very high contrast, with pretty rapid light falloff. And the areas between lights were still pretty dim. I spent the whole night at ISO1600. Second thing: They were fast. Unfortunately, I only caught the elite men's race; but man was it a race. I won't spoil the details this early in the post, but the race really came down to the wire. And as an extra positive, most of the folks I was there with, many of whom had never seen a race before, really enjoyed it. Last thing: Buy me a lens :o) Well, I'm working on this one myself, but I really could have used a shorter fast zoom. I spent the entire race on my 80-200mm f/2.8, but a 17-55mm f/2.8 or 24-70mm f/2.8 would have really fit the bill. Ok. That's it for the complaining, so here are the goods. 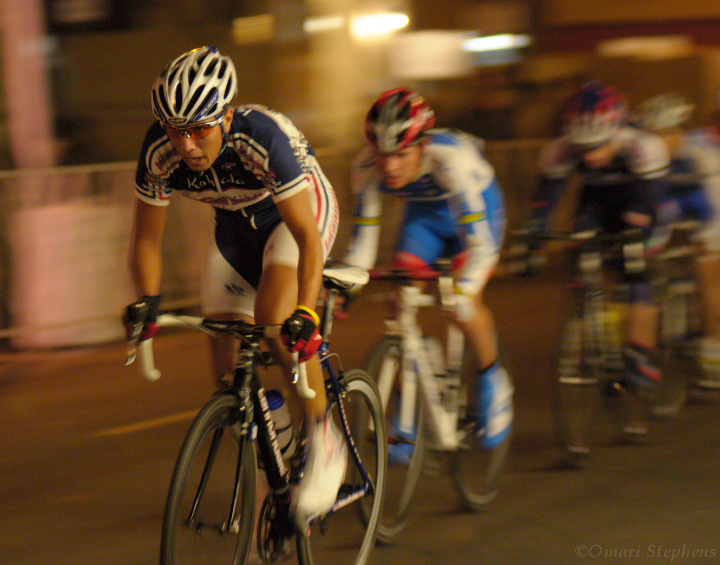 The photo above (1/100s at f/2.8 and ISO1600) was earlier on during the race. The race format was 90 mins+10 laps: regardless of how many laps they had finished up to then, at the 90-minute mark, they had 10 laps left. So the timer on the left told the race time, counting up to 90 minutes, and the timer on the right told the lap times (a group off the front had reset the lap clock 10 seconds prior). 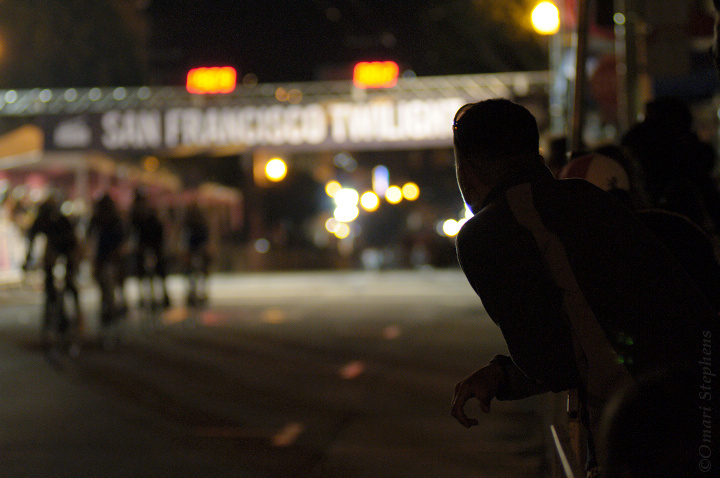 I like this photo because it's a nice overview of the race — dark, grungy, fast. Fly by night. I really like silhouettes, and I think this one came out well. I was leaning over the railing about 20m past the start/finish, and this guy was doing the same thing. I had tried to shoot four-man break for a couple laps in a row, so I switched things up and focused on the guy. Boom. 1/125s at f/2.8. I have no idea how this photo happened. Of course, this is exactly why I experiment, because luck is a big part of photography. In all of the photos I've ever taken (somewhere north of 100,000), I believe this is the third time I've gotten this effect. The first time was in late 2004 or early 2005, while shooting gymnastics. The second was at a track meet during January or February of this year. And now this. Cool. 1/40s at f/2.8. I shot this photo just about halfway into the race. This guy attacked the field on the climb and was all over his machine as he rounded the turn, trying to milk every last drop of power out of it. Unfortunately, his advantage didn't last long. 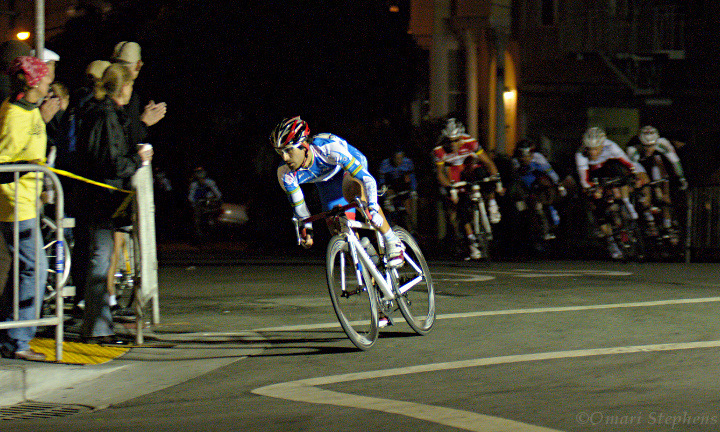 In this image, though, I really like how the chasers in the peloton seem to be stalking him from cover of darkness. This was 1/160s at f/2.8. Well, that's that. Short and sweet. And the surprise ending? A guy that I don't think I managed to catch any good frames of made a move that stuck, and won by a 2-second margin. The guy in third photo (of the four in this post) placed third, just narrowly losing out to a rider with massive quads.